The goal was to promote a brand new product in a competitive industry. I was brought on to help launch the new website, develop an ongoing SEO strategy and build brand awareness. Impressions is an at-home orthodontic treatment that costs about half as much as braces and takes about half as long to complete. 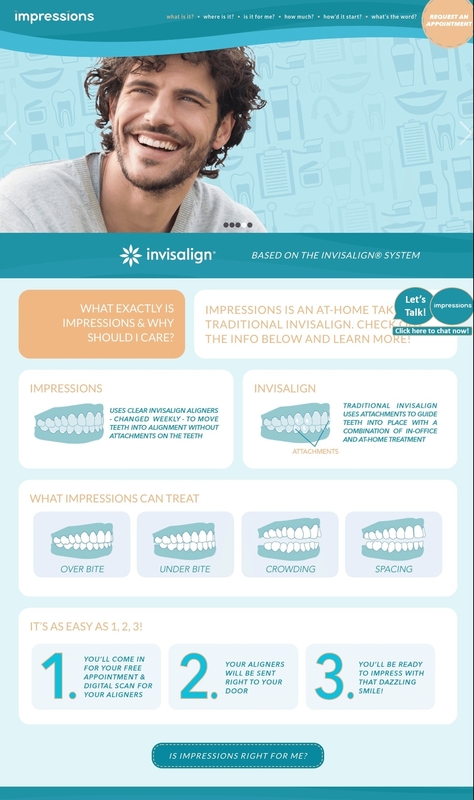 At-home invisible aligners are a very competitive product to market. Not only are they a high ticket/high consideration purchase, but many competitors offer an entirely at-home treatment while my client’s first and last visits are performed in their North Carolina office. Having the scans taken in office by a board certified orthodontist enhances the quality and precision of the treatment; however, it inevitably generates significant geographical limitations and higher costs than competitors such as Smile Direct Club and Candid Co. Considering the limited budget and geographical boundaries, we felt the best course of action was to focus on SEO and building brand awareness in North Carolina. So while competitors were putting more money into PPC campaigns, we focused on developing a solid blogging and content marketing strategy that would help the website rank for our target keywords. This content could also be promoted on social media to build Impressions’ brand awareness. in order to develop topics for the blog. Another challenge we have faced from an SEO perspective was that the client wanted to have a 1-page website for Impressions. So we have leaned heavily on the blog in order to drive more organic traffic.